So far we have produced only one ltd edition print from the CISPAP, that which accompanies the Collectors Edition, (of which there are only 3 left), and no-one else is permitted to have those except CE subscribers. Only three further Ltd Edition prints are planned, from the extensive art work in the book, and the first of these has just come off the press. It is an A4 size print (same size as the CISPAP itself) and is designed to go into a standard A4 frame without a mount - which it does not need, having a thin bronze/gold border. This makes it very cheap for purchasers to frame, as the print does not need bespoke framing. It is entitled "Triclours" and features four of the most popular drawings from the CISPAP - in fact one, the header drawing from "Age and the Standard" was the most loved and desired piece of art work in the whole book. In the top left hand corner of the print is the correct, dark eyed version of a sequence of four from "Eye and Expression", and in the top right hand corner is the fully coated 3 year old version of "Mercury", our imaginary tricolour Papillon from "Age and the Standard". 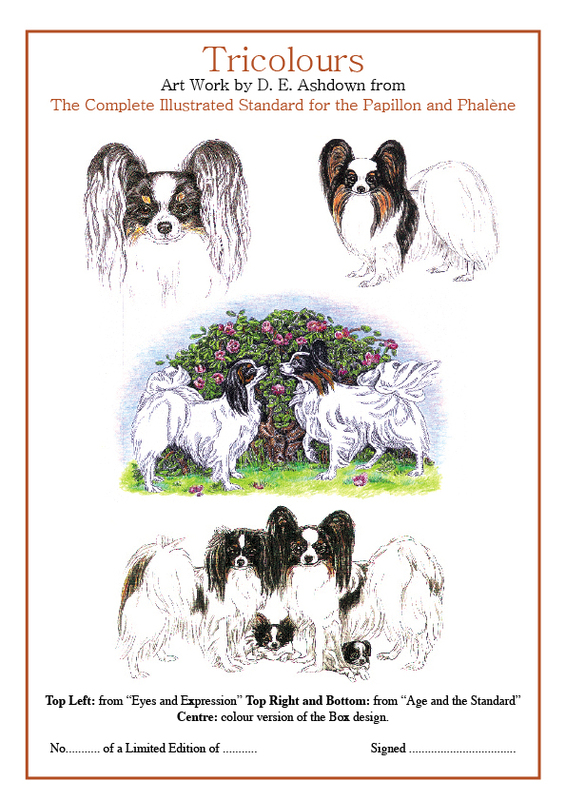 At the bottom is the header drawing from this section, featuring the "Tricolour Family" - male adult Papillon, female adult Phalene and their two Papillon and Phalene puppies. It is the centre drawing, however, that makes this print absolutely unique. It shows the design for the Box, (another very popular drawing), but this version is not in burgundy monochrome, as the Box cover was - it is a full colour version, done specially by Deirdre for this print, in which the Papillon and Phalene are shown as tricolours. You can now see the pink rose bush in the background in full colour, the grass and sky have also been coloured. "Tricolours" from the CISPAP is issued in a Limited Edition of only 80 prints, numbered 1 - 80 and signed by Deirdre; no more of these prints will ever be produced. Several have already been ordered, pre-publication. Two companion Ltd Edition prints are planned for later in the year, also using some of the best liked art work in the CISPAP and in each case there will be a special version of one piece of art work, not previously seen in that form. One will feature only Black/White dogs, the other only various shades of Sable/White. Some consideration may be given to reproducing, in Ltd Edition print form, all 9 red sable/white dogs from "Markings" as this was the sequence of art work everyone seems to have liked the best.